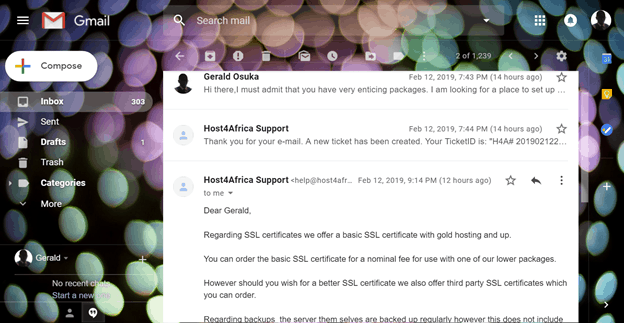 Host4Africa Review 2019: Is Host4Africa a Good Hosting? Host4Africa is a company based in South Africa that offers shared hosting for companies both small and large. The platform is a little dated, but it should suffice if you’re simply looking to host a basic website on a limited budget. Catering to the South African market with servers located in the United States, Host4Africa is a web hosting provider that focuses on affordability above all else. The company offers shared hosting services for a variety of clientele, from personal bloggers to large corporations seeking e-commerce solutions. All services are offered in English. Host4Africa has six shared hosting packages ranging from Tungsten, the most basic plan, to Platinum and Rhodium, the high-end plans. You’ll find the two lower-tier packages extremely limited, with only one MySQL database and either 350MB (Tungsten) or 2.5GB (Copper) storage. Most plans include a free .co.za domain, but none of the plans include a free SSL certificate. That said, at least Host4Africa offers the Softaculous app installer, so you’ll be able to install popular CMSes such as WordPress fairly easily. While Host4Africa’s rates are certainly affordable, I find the packages rather restrictive even considering the low prices the company is charging. For instance, telephone support is only included with the higher-tier plans; lower-tier plans only get ticket/email support. You also only get 350MB of storage on the entry-level plan; you can find a plan with more storage at a similar rate elsewhere. This is on top of the fact that SSL certificates are an additional cost, even though the plan pages indicate that these are included for free. Similarly, if you’d like support staff to install WordPress, Joomla, or the Gravity Forms WordPress plugin for you, these will come at additional charges. All this means that Host4Africa isn’t as affordable as it claims to be. You can choose from monthly, quarterly, semi-annual, annual, biannual, and triennial contracts. The lower-tier plans only give you the option of one, two, or three-year contracts, though. Host4Africa accept payments through credit cards, bank transfer (EFT), and Bitcoin. Note that the company offers no guarantees for uptime, no money-back guarantee, no free trial period, and no discounts. Host4Africa doesn’t offer round-the-clock customer support; you can only get in touch with them during regular business hours. I gave their ticket support a try and it went well. They responded in about two hours with specific, detailed answers. Host4Africa also maintains a rich FAQ section, so if you need help outside of business hours, you can check this out. Although Host4Africa looks good at first glance, upon a closer look, the company’s packages and prices aren’t as attractive as they seem. Ticket support was fairly responsive, but the hidden costs and resource restrictions may prove to be a detriment to your website in the long run. 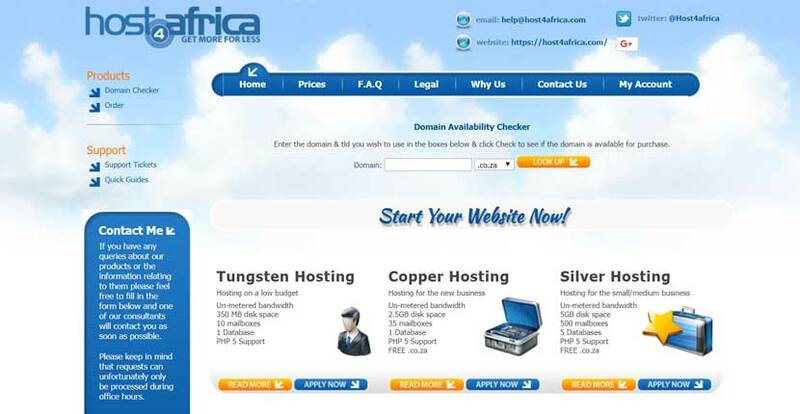 Wondering how Host4Africa stacks up against other Web Hosting companies? Enter any other Web Hosting company and we will give you a side-by-side comparison.